If President Trump wants to punish Amazon for lousy Washington Post coverage, it's working. Amazon stock sank 5% on Monday after Trump renewed his attacks on the company on Twitter. It has lost $60 billion in market value since Axios reported last week that Trump wants to "go after" Amazon. Trump once again accused Amazon of taking advantage of the US Postal Service, and he suggested that Amazon does not pay its fair share of tax. In fact, Amazon pays the same lower rate that the post office charges other bulk shippers, and it collects sales tax in every state that charges it. 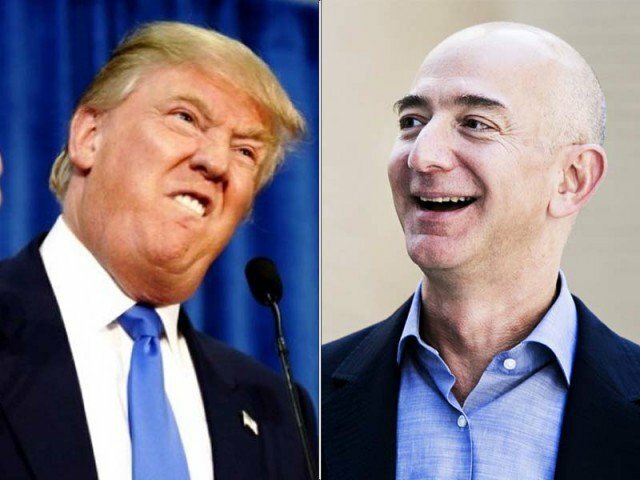 The president has said he dislikes Amazon because CEO Jeff Bezos also owns The Washington Post. He has said without proof that he believes Bezos uses the newspaper to lobby for Amazon's business interests. Amazon does not hold a stake in The Washington Post. Trump has tweeted about Amazon four times in the last week. Amazon's (AMZN) drop is contributing to the broader market's fall. The Nasdaq tumbled 2.7% Monday. Investors have started to shed tech stocks, fearing increased government regulation -- particularly in light of Facebook's recent privacy scandal. "There's a regulatory cloud over all the tech names right now," said Jefferies analyst Brent Thill. Apple (AAPL), Amazon (AMZN), Google (GOOGL), Microsoft (MSFT), and Facebook (FB) made up nearly a quarter of the market value of the entire S&P 500 as of the end of February. They contributed to the market's climb last year. Amazon gained 56% in 2017. "When you're a $700 billion market cap, you become a target," Thill said. Amazon now has a $664.2 billion market value after its drop. Trump's attacks could "keep a lid on the stock short term, but long term there's no real change to our positive thesis," he said. Bill Smead, who runs Smead Capital Management, said he believes the company's price tag is unsustainable (he doesn't own the stock). Amazon's price to earnings ratio, a measure of how expensive the stock is compared to every $1 of earnings, sat at 223. The average ratio on the S&P was 27.5. "It is absolutely inevitable that at some point the very, very high multiple that gets attached to them becomes a curse," Smead said. 0 Response to "Amazon stock sinks following Trump's attacks"